What if I lose my phone with my keys? Neat idea; a bit cleaner that one of those little tags with your contact info on them. Even worse, what if the person who found your keys lost their phone?! How is that “even worse” if the OP still has his phone? So not only do you lose your keys, you also give whoever finds them a personally identifying piece of information? Great hack! Can you even be identified by your mobile phone number? I’d be worried that your address could be determined by looking up the number but there doesn’t seem to be any easy way of doing this. Hello, my name is Karl, I’m calling from is “utility company” services for “area of found keys”. We’re just calling to confirm your request for a meter change over, but first we need to take a meter reading. Can you confirm your name and address please. is that “number number number”? yes, but im not tompson. oh sorry, we must have the wrong number. Just so we can update our records, can I take your name please. at that point, most people will at least give their name out. If you know the area, you can precall the utility company to check procedure. Its really not hard to get information out of people. Social hacking. In my country, yes. If the person doesn’t have prepaid or secret (as in non-publishable) number, there are services that let’s you find out whos number it is, where he/she lives and gives you link to a map and driving instructions. Instead of leaving your actual number, you could leave a Google Voice number or an email address…or both. That’s what I would do. If I were to make my own I’d leave my google voice number and an email address. Additionally I’d leave instructions on the back on how to actually use the code for those who have no idea what it is. Also seems like a neat way to exchange phone numbers with someone you might meet out somewhere (like half-drunk in a dark barroom, etc). Just have the other scan your keychain. Maybe the idea is to pique someone’s curiosity? 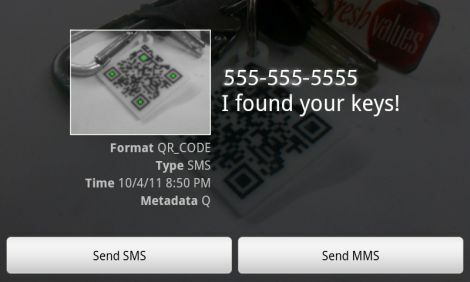 …and create a QR code that IS your phone number? What is this magical force that lets any smartphone with a camera take a picture and have an SMS get sent? I don’t know about anyone else, but all three of my smart phones require a QR code reader application in order to do such a thing. Simply taking a picture just won’t do it. what he said, everyone i’ve spoken to doesn’t know how to read a QR code. A normal label works for everyone, no matter how tech savvy they are. my phone doesn’t even have a camera, let along apps to do QR decoding. I don’t think his all knowing noodliness would need a QR reader to know your contact info. The last Android phone I bought came with a QR code scanner in the stock firmware. The Android Market always advertises QR scanners too. Also, if it’s a good Samaritan who finds your keys and takes them to the police, someone who works there is guaranteed to have a phone with a scanner and the knowledge to use it. Cops absolutely love smartphones these days, it’s a good distraction toy at 2am when the city is sleeping and no calls are going out. I think printing the QR on shrinky-dink paper would achieve the same effect and be more accessible than a laser cutter for other hackers. Trick is to know how small the paper shrinks so you can scale the image you print the right amount so the tag is a good size. VERY nice basic Hack both in concept and execution details. I may be replicating this or variants. Yes, there’s a “risk” in linking an access device to *ANY* identifiers. But, when a transponder key for our cars has a >$100-300 replacement cost per key, or more if you count consequentials? There might be a risk mitigation by using a FW: Bureau? or similar obfuscator of “who” owns the keys while still getting them back to the rightful owner. There’s prior art that got part of it “almost” handled. The concept was- you’d have the miniature replica of your car’s license plate on your keys- and a good samaritan would drop keys in a mailbox, so they would get returned to you. It seemed like a good idea- at first. The gnarly downside came along a bit later. As the tags were purely epic Failbait that sadly taught folks about the descent of ethics: The plate info became a physical location vector for criminal acts. Or worse. Hmn- There’s also a potential category of malware vector lurking in unsecured QR handling,that someone’s going to find about the hard way. Sorry, but I don’t understand the obsession with QR codes. This is slick and all, but why doesn’t the tag just straight-forwardly have his phone number? Because if the ‘finder’ is curious enough to scan the tag the owner is notified who has the keys…whether the ‘finder’ wanted to notify the owner or not. How about adding a label “For personal use only” or “Don’t scan this code” to lay a little reverse psychology on them. No QR code programs usually aren’t allowed to automatically do such things, see the send buttons at the bottom? The user must opt for the action to happen first, this way they can preview URLs, numbers, and actions. Most of the time when we scan one of these we have no idea what it’s going to try and do. the writers of the QR decrypt programs realize this! You could always have the QR lead to a special web page, so you could at least know when you got a hit on the page. Then whether they decide to send the text or not, you at least know that somebody found it. Maybe some printed instructions on the reverse, and as an alternative for non smart phone users, add Please call this mobile number if you find my keys. Reward optional. Sure, this QR code is so much cooler of itself, but if I was going this route I’d want to maximise my chances of getting my keys returned rather than narrow it. Next to feature will be a QR code tattoo that texts your mother if found disorientated after a night of heavy drinking! I wouldn’t want my keys returned, once I’we lost them 8 assume someone has made a copy and their security is compromised. I would however offer a juicy reward on the keychain… just so I could hurry up changing my locks if someone called telling me he found the keys. I see the logic in your paranoia, but surely copying a set of keys if you don’t know where to use them is a lot of wasted energy, as is changing your own locks. Clearly when they contact you, you wouldn’t be inviting them over to your house to return them, you’ll arrange to go to meet them at their place or at a cafe and buy them coffee or something! @BitMage, couldn’t have said it better myself. no idea of that simple word “PRACTICALITY”. What if a 74 yr old homeless guy finds it ? know what a QR code is ? Nothing stopping you from etching that on the back of his QR keychain adding “or just scan the QR code to send an automated TXT”. The OP won’t have to worry about losing his keys anyway because it will be in the back of his head, now that he has put so much effort into retrieving his lost keys. I’m concerned about the last paragraph. He will immediately receive a text! Surely the finder has to approve the sending of the text otherwise this is malware! Sure, it would be more practical. But we’re hackers, people. Try the strange and unusual, see if it works. Also, for the security-concerned: hook it to a Google Voice number. Problem solved. You could have a QR code on one side and the info etched on the other, someone who knows what a QR code is will scan it out of curiosity, I’m not sure if it does this already but it should automatically send the text without input from the person scanning, aka to them it just says what is etched into the keyfob but in the BACKGROUND it sends a text so that someone who didn’t intend to return it still tells you. Yeah, but that’s a really bad thing from an attack vector sort of thing. Imagine someone placing QR codes everywhere that do nothing but send a text off to those numbers that charge several dollars per message. That’s a nice way to grab money from people who like to scan random QR codes. Or imagine a QR code that automatically sends you the a website which executes code designed to compromise your phones OS… automatic anything is bad in a world where there are people out to take advantage. QR codes that go to URLs that “could potentially” pwn your phone totally exist, and can even gather your location data when you’re pwned. I help distribute them for a research project. Enjoy! Folks- just because we “Can” often means we BETTER NOT” do some things. IF some indefensible sociopath succeeds in making QR’s poison, *ALL* of what we’ve done with them is between endangered to STONE COLD DEAD. Perhaps you think me overstating it? Why in hell do you think the very term “Hacker” has been taken away from it’s original usage and rendered a synonym for criminal? The webpage could include contact information for the person that found the keys. It could also email/text/whatever some GPS info (via geolocation api, since we’re assuming a smart phone anyway). The tag could also include contact information to help cover more potential finders. You could potentially add some RFID to that tag too, so you can get an alert when your phone is out of range of your keys (instantly on your phone, but also an email/whatever else)… so at least when you loose one something happens… just don’t loose both in the same place. If someone found your keys I don’t think its a really good idea to lead him to your house. QR codes are irrelevant. Your uniqueness will be combined with our own. Anyone rememeber shrinky dinks……perfect! any arts and craft store! Am I the only one that is impressed with the use of the polymer clay to fill in the engraving? I think that is a excellent durable finish. Why not get a bunch of public locker keys (do they still have those), put these tags on them with the message “Put me in my locker at (address) and get a suprise!” Fun little game. Public lockers – the ideal secure bomb location eh! I’m sure the US has something similar but in Canada you can get a which maintains your anonymity while allowing people to get your keys back to you. Messed up the link. Should be War Amps Key Tag. What if the person who finds your keys, finds out where you live with the help of your cell-phone number and just walks right in your door with your key? I have a smart phone and refuse to scan QR codes. It’s just too many steps for too little reward. If, however, there were a phone number printed on it, I would probably call and leave it at the service desk somewhere nearby. And fyi, I don’t need your phone number on your keys to find where you live. Just walk around the parking lot hitting the panic button. Once your car goes off, I have your registration, address, car, and entry to your house.